3x10 Wicker Antique Brass Floor Register Discounts Apply ! Antique brass floor registers are a beautiful addition to any home. 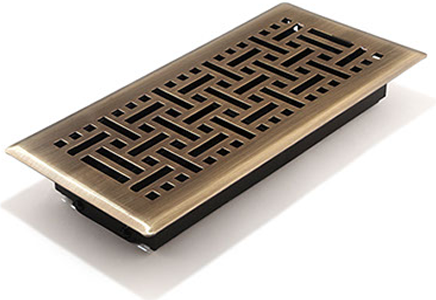 These metal floor vents are stylish and made of durable steel. Antique brass floor register covers have a finish that is tarnish resistant, giving you worry free maintenance. These metal floor vents have a damper that can be regulated. Antique brass floor registers can withstand up to 200 pounds. For metal floor vents that are understated with a designer look the 3 x 10 inch wicker style antique brass floor register is the choice for you. ***Hint: The industry standard is to order using the actual hole opening size and not the faceplate size. These metal floor vents will fit a 3 x 10 inch hole opening. 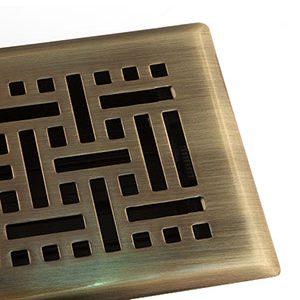 Metal floor vents are available in other sizes and in additional finishes. Antique brass floor registers are ready to order today!